1. Fill the large bag half full of ice, and add the rock salt. Seal the bag. 2. Put milk, vanilla, and sugar into the small bag, and seal it. 3. Place the small bag inside the large one, and seal it again carefully. 4. Shake until the mixture is ice cream, which takes about 5 minutes. 5. Wipe off the top of the small bag, then open it carefully. Enjoy! 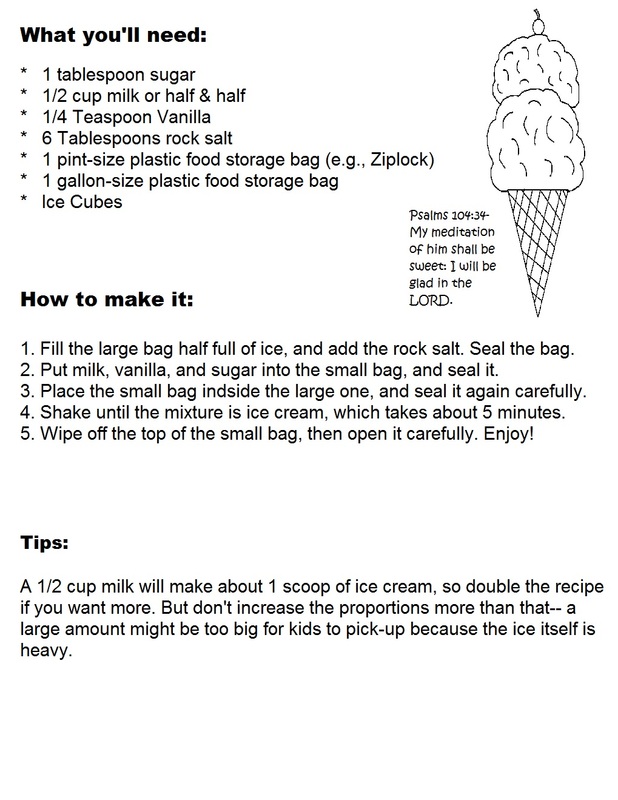 Tips: A 1/2 cup milk will make about 1 scoop of ice cream, so double the recipe if you want more. But don't increase the proportions more than that--a large amount might be to big for kids to pick up because the ice itself is heavy. Do this with your kids in Children's Church. Have the kids line up next to you. Have the ingredients all out in front of you and pour the stuff in the bag and hand it to the child to go back to their seat and start shaking for 5 minutes. This will keep the spills under control if you do that part for them. When they are done hand out some plastic spoons and they can eat right out the bag or if you want you can give them each a bowl. It will be a lot easier to just give them a spoon. Make sure they wipe the salt off the top of that bag before they open it up to eat it. 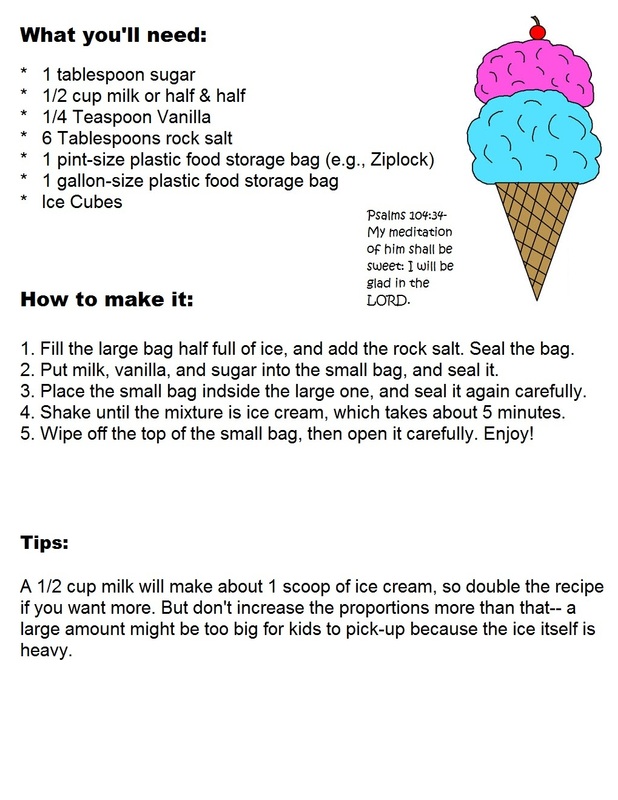 This fun 5 minute ice cream in a bag recipe go right along with our Ice Cream Cone "Jesus is Sweet" Sunday School lesson plan that we created. Go check it out! Pour your 1/2 cup of milk or half & half into a pint size plastic ziplock bag. Then add 1 Tablespoon of sugar and 1/4 teaspoon of Vanilla. Seal the bag really good. Fill your gallon size plastic ziplock bag half full of ice . Add 6 tablespoons of rock salt. Now place your small bag inside of this huge bag and seal it up. Now get to shaking it up. Have the kids shake for 5 minutes. Here is my child holding up the solid ice cream. 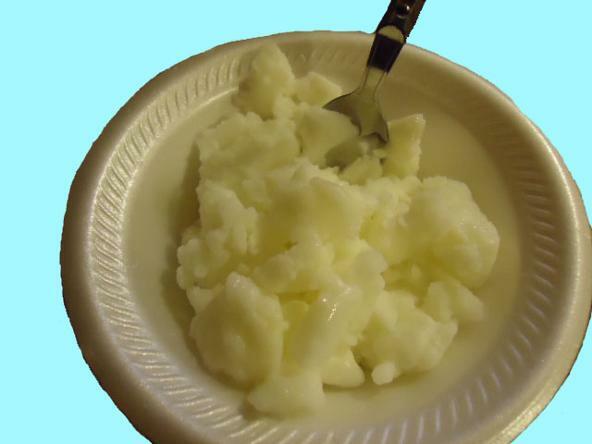 And NO, this is not mashed potatoes it's ice cream. My husband told me it looked like mashed potatoes in the picture. It took just 5 minutes to make it. So easy and tastes so good.